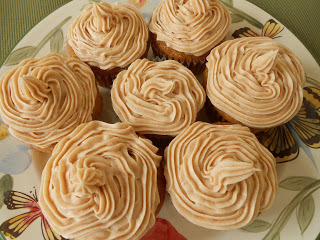 We’re continuing the pumpkin theme for fall with yummy cupcakes! Naomi says, Every month, I attend a live book club at my library. I love bringing fresh baked goods to them and my library staff. It allows me to try out new recipes for the blog and not have them stay at my house to call out to me. While speaking to the library manager, she talked about her love of anything pumpkin. I remembered seeing this recipe while on Pinterest and thought this would be a perfect time to try it, while giving her a nice treat. It originally was on Taste of Home, which is one of my favorite food magazines. These cupcakes were even better than what I thought they would be. They were moist and the frosting on the cupcakes were unbelievable. They were even pretty simple to make as well. The recipe garnered about 24 cupcakes. 1) In a large bowl, cream butter and sugar until light and fluffy. 2) Add eggs, one at a time, beating well after each addition. Add pumpkin. 4) Add the flour mixture to the creamed mixture alternately with buttermilk, beating well after each addition. 4) Fill paper-lined muffin cups three-fourths full. 5) Bake at 350° for 20-25 minutes or until a toothpick inserted in the center comes out clean. 6) Cool for 10 minutes before removing from pans to wire racks to cool completely. 1) In a large bowl, beat cream cheese and butter until fluffy. 2) Add the confectioners’ sugar, vanilla and cinnamon; beat until smooth. 3) Frost cupcakes, as desired. Please send me a dozen! (JK) They look fabulous, but my baking days are over. Saving this in my Bette yummies folder! I could eat a whole platter right now.